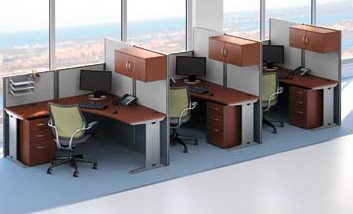 Office in an Hour Cubicles are easy-to-order, prepackaged panel workstations. 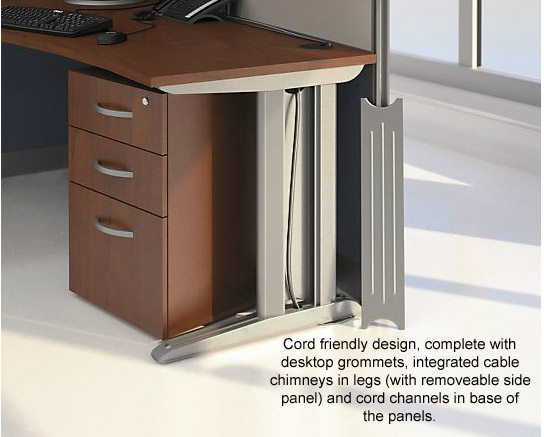 These configurations are perfect for businesses that need basic administrative workspaces quickly. Office in an Hour features time saving installation methods, melamine work surfaces and a cable friendly design, all in aesthetically pleasing color combinations. 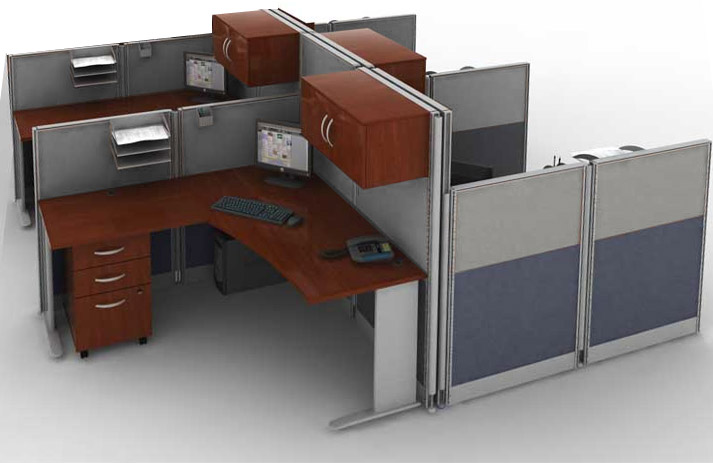 As businesses grow and additional desks are needed, multiple workstations can be easily configured into pods to maximize tight office spaces. 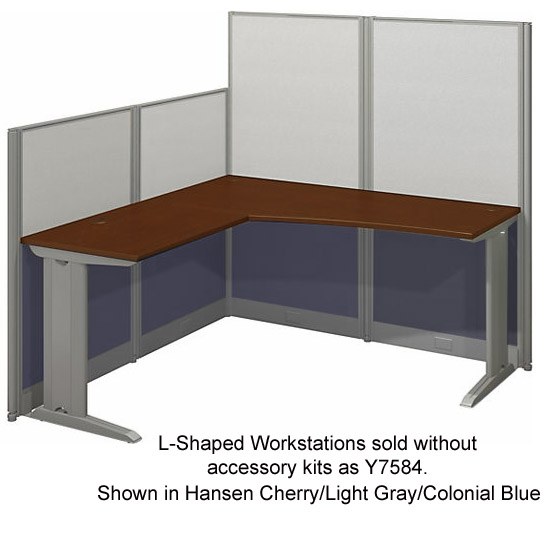 L-Workstation with Accessory Kit sold above. Other cubicle configurations sold below. 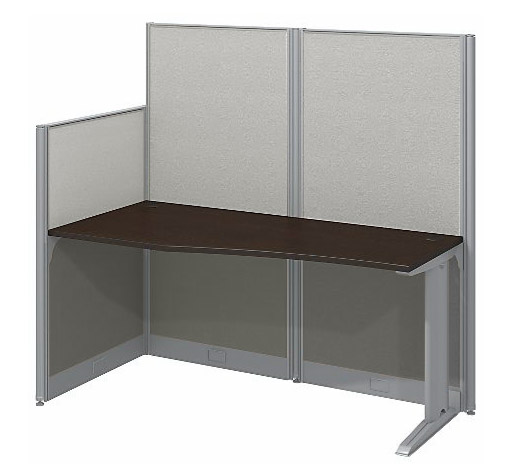 The Office in an Hour Collection goes together quickly and easily to create a freestanding panel office solution. 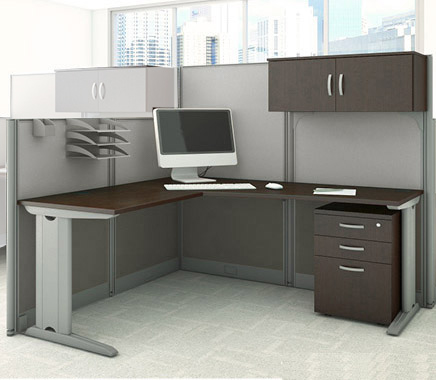 Choose either a straight workstation with panels or an L-workstation with panels, with and without storage accessories. 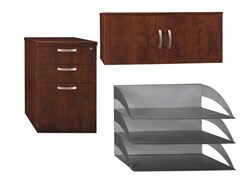 Storage accessory kit includes a 3-Drawer File, Hutch, Paper sorter and pencil cup (File and Hutch are fully assembled). 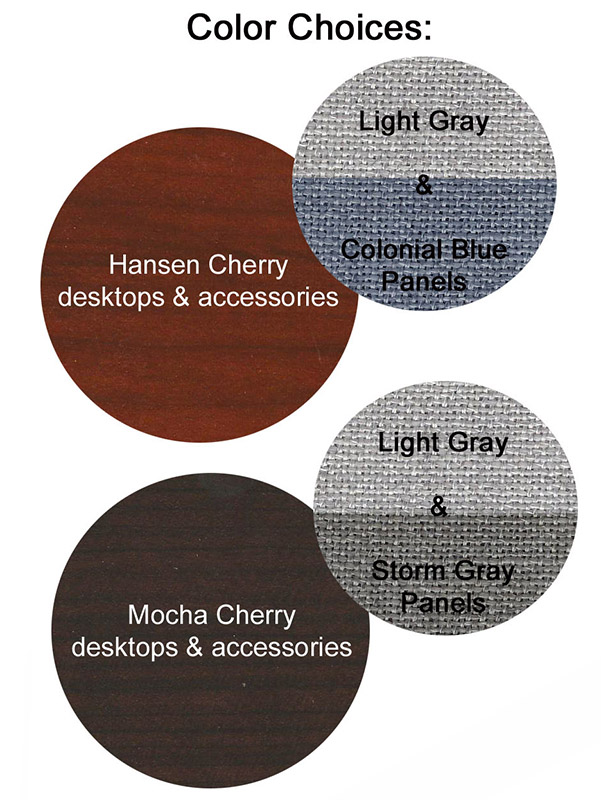 All configurations are available in two color combinations: Hansen Cherry desktops with two-tone Light Gray and Colonial Blue fabric panels or Mocha Cherry desktops with two-tone Light Gray and Storm Gray fabric panels. Each workstation features metal framed panels in two different heights: 63�H backside panels for privacy and 47�H side panels for collaboration. Thermally-fused desktops are durable, scratch resistant and easy to clean. Desk top grommets and cable chimneys in legs made routing and concealing cords a breeze. Side panels of legs are removeable. Legs include leveling glides for uneven floors. Office in an Hour meets applicable ANSI/BIFMA standards for product performance and safety. 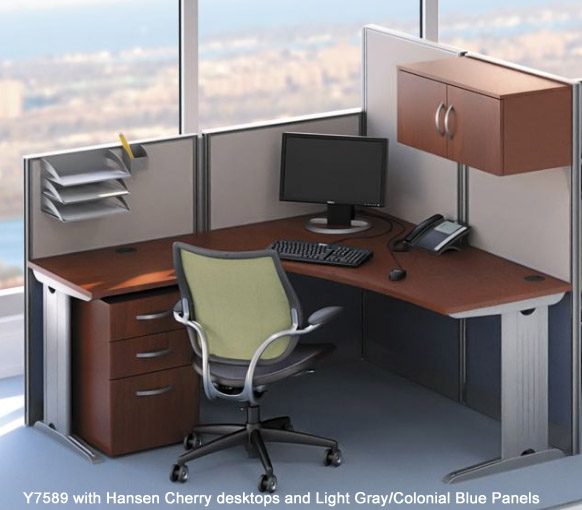 Commercial quality workstations are backed by a 10-year warranty. L-Shaped Workstation with Storage Accessories features a non-reversible configuration. Measures 64-1/2"W x 64-1/2"D x 63"H overall. Shpg. wt. 368 lbs. PRICE INCLUDES SHIPPING! (Truck shipment - See Terms & Conditions). Please allow 2 weeks for delivery. Office In An Hour L-Shaped workstation is an economical way to outfit your office with cubes. Features two-tone fabric panels that come in two different heights: 63�H and 47�H. 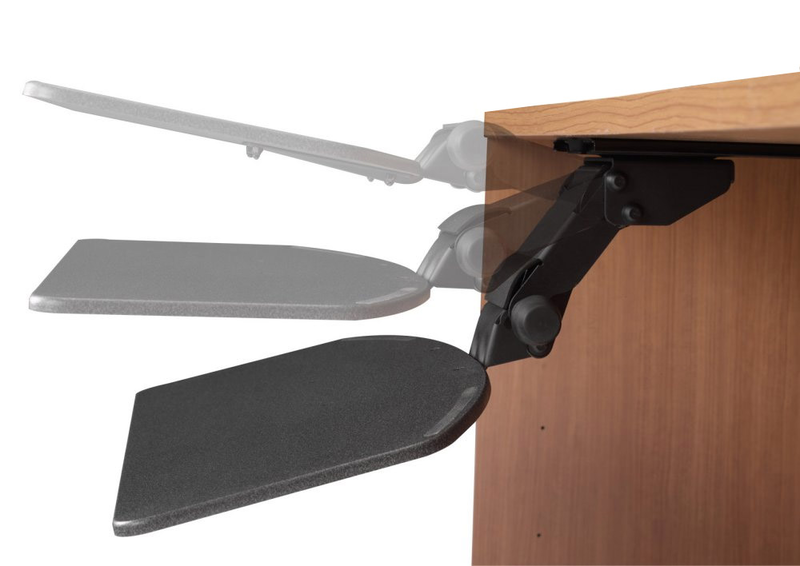 Scratch-resistant melamine desktop features grommets for wire management and the legs of the desk feature a removeable side panel to route cords through the leg. Y7584 is sold without storage accessory kit. 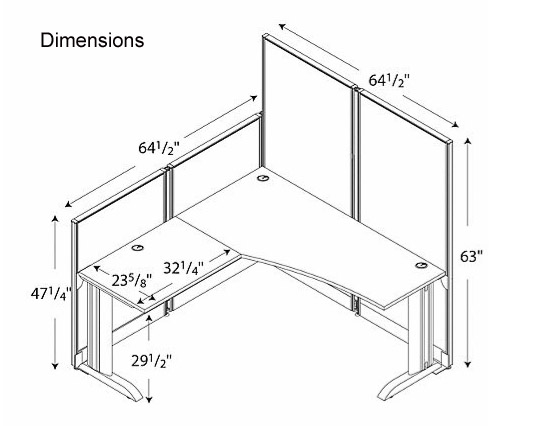 L-Shaped Workstation features a non-reversible configuration. Measures 64-1/2"W x 64-1/2"D x 63"H overall. Shpg. wt. 246 lbs. PRICE INCLUDES SHIPPING! (Truck shipment - See Terms & Conditions). 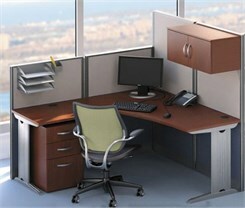 Office In An Hour Straight Cubicle with Storage Accessories has it all! Compact design fits almost anywhere. 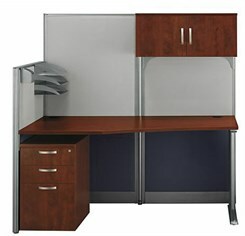 Includes melamine desktop with 3-drawer file, hutch, paper sorter and pencil cup. Features two-tone fabric panels that come in two different heights: 63�H and 47�H. Features a non-reversible configuration. Measures 64-1/2"W x 32-1/2"D x 63"H overall. Shpg. wt. 304 lbs. PRICE INCLUDES SHIPPING! (Truck shipment - See Terms & Conditions). Office In An Hour Straight Cubicle Workstation features a compact design that fits almost anywhere. 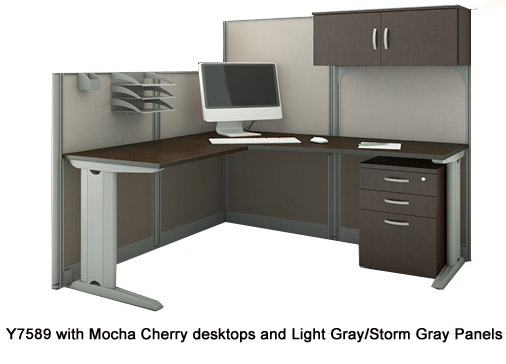 Includes melamine desktop with grommets for wire management. Features two-tone fabric panels that come in two different heights: 63�H and 47�H. Features a non-reversible configuration. Y7585 is sold without storage accessory kit. Measures 64-1/2"W x 32-1/2"D x 63"H overall. Shpg. wt. 185 lbs. PRICE INCLUDES SHIPPING! (Truck shipment - See Terms & Conditions). 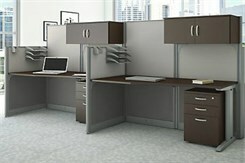 Includes two Y7588 Straight Cubicle Workstations with Storage Accessories. Two-tone fabric panels come in two heights: 63"H on the back panels and 47"H on the sides. Hutch, file, paper sorter and pencil cup included for each workstation. Requires 129"W x 32-1/2"D of floorspace. Shpg. wt. 608 lbs. PRICE INCLUDES SHIPPING! (Truck shipment - See Terms & Conditions). 1 - 2 $4,479.00 ea. Includes three Y7589 L- Workstations with Storage Accessories. Two-tone fabric panels come in two heights: 63"H on the back panels and 47"H on the sides. Hutch, file, paper sorter and pencil cup included for each workstation. Requires 193-1/2"W x 64-1/2"D of floorspace. Shpg. wt. 1104 lbs. PRICE INCLUDES SHIPPING! (Truck shipment - See Terms & Conditions). 1 - 2 $5,969.00 ea. 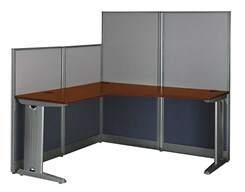 Create a quad cubicle workstation! Includes four Y7589 L- Workstations with Storage Accessories. Two-tone fabric panels come in two heights: 63"H on the back panels and 47"H on the sides. Hutch, file, paper sorter and pencil cup included for each workstation. Requires 129"W x 129"D of floorspace. Shpg. wt. 1472 lbs. PRICE INCLUDES SHIPPING! (Truck shipment - See Terms & Conditions). Includes Storage Cabinet, 3-Drawer File and Paper/Pencil Storage. Storage Cabinet and 3-Drawer File ship assembled. Storage Cabinet measures 30"W x 13-5/8"D x 13-1/2"H. 3-Drawer File measures 16"W x 20"D x 25-3/8"H. Shpg. wt. 119 lbs. PRICE INCLUDES SHIPPING! (Truck shipment - See Terms & Conditions). 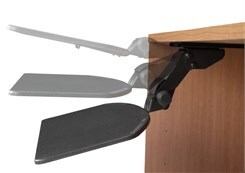 Black articulating keyboard tray can be mounted under any Office In An Hour worksurface. Measures 27-1/4"W x 15-3/4"D x 7"H overall. Shpg. wt. 11 lbs. PRICE INCLUDES SHIPPING! (Truck shipment - See Terms & Conditions).